I thought these three shots needed to be together. 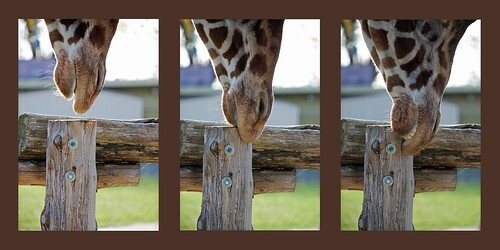 There is something about giraffes that never ceases to amuse me. There will be more shots from today as time permits, though I have some things I want to try that may take a day or two. Houston ... do we have clearance for landing? Yes? Confirming, we have a GO, Houston. ZooShip SpottedGiraffe-09 now commencing landing procedures. .... uh .... crap, the lips mechanism slipped off the landing platform! I would totally buy this as a triptych. Possibly for pending niece's nursery. Just sayin. Thanks Jess. It'll print fine to 13"x26". A photo print mounted on foam core would be $150, but I am certain I can get a poster print for under $50 (but I need to do some confirming of that). Let me know!